While scanning through my more than 30 years old ZX Microdrive cartridges I found stuff that is already available at the ususal ZX Spectrum archive sites (World of Spectrum or ZXDB). Nevertheless there is still room for improvement! One tool I found really useful was a type-in in the German computer magazine Computer Kontakt (issue 17, 1/1986) and was written by Holger Ahrens. 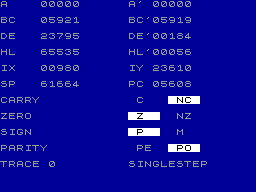 It is a very small and efficient monitor programm that uses the IM2 interrupt and presents a clear menu that shows all relevant register/flag contents. Further it enables the developer to single-step or trace in different speeds through the code. 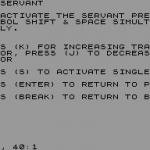 Very helpful especially for the beginner’s mixture of ZX BASIC and Z80 assembler. 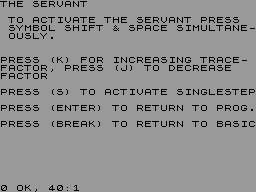 This little gem could not be found in the ZX Spectrum archives, so I decided to produce a little tape image package, make a short translation of the German instructions and upload it to the ZXDB. Now you can download it from ZXDB (or from here). Happy coding!